Melotone was owned by Brunswick Record Corporation and marketed as a budget-brand record. It was discontinued by 1938. Melotone labels were silver on blue, but in 1934 the colors were switched to gold on dark green. By late 1936 or early 1937 the label went back to silver on blue. Melotone would often carry duplicates of music found on other labels. Many of Melotone’s recordings were done under pseudonyms or anonymous. Several important artists recorded under this budget brand: Blind Boy Fuller, Eddie Cantor, Annette Hanshaw, Lead Belly, Gene Autry, Tex Ritter. Music Genres: Pop, Country, Western, blues, jazz, swing, Cajun, Hawaiian, Mexican. Pre 1941 Label: A combination of silver on blue or gold on dark green. The original label was silver on blue. This color scheme was in production between 1930-1936. Record Label: Early label. Original silver on blue. 1930-1934. Sometime in 1934 they made a switch to a gold and dark green label. This would be in production until 1936. Record Label: 1934-1936. Gold and dark green. In the label’s final years they would switch back to the original silver on blue label. Note the “Full Range Recording” at the top. Record Label: 1936-1938. Back to original blue and silver. Numbers from start to 1945: 12000-13457. 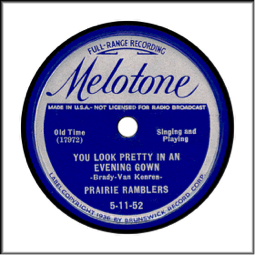 Prior to 1935 Melotone records started with an M. However, by 1935 some start with a “35” or a “5.” Some numbers for 1936 start with a “6.” Some numbers for 1937 start with a “7.” Some numbers for 1938 start with an “8.” The early label Melotone’s numbering system would include the date as representative as the last 2-digits (12030 would mean a record was made in 1930).